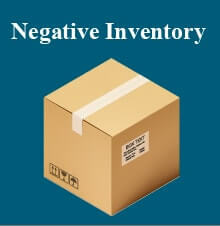 In SAP Business One, you can allow or block negative number (below zero) of your inventory. You can setting it on Administration – System Initialization – Document Setting – Block Negative Inventory (check the box if you want to block). Company : When you specify Block Negative Inventory By Company, SAP Business One blocks an item only when its cumulative inventory quantity across all warehouses in your company goes below 0. Warehouse : When you specify Block Negative Inventory By Warehouse, SAP Business One blocks an item if its inventory goes below 0 in any warehouse to which it has been assigned. Item Setting : When you specify Block Negative Inventory By Item Setting, SAP Business One blocks negative inventory either at company level or for each warehouse, depending on the status of the Manage Inventory by Warehouse checkbox in the item master data.